Unlike so many of Our Lady’s titles, which go back centuries for their origin, this one is quite recent. The events which gave rise to this title took place less than one hundred years ago. By the last half of the nineteenth century the Valley of Pompeii, near Naples, was practically deserted. Of the comparatively few people who still lived there, most had lost their ancient Catholic faith; ignorance and superstition prevailed. Only a handful of people bothered to attend the services in the little parish chapel. In October 1872, a man named Bartolo Longo came to the valley. He was the husband of the Countess of Fusco, who had some property there; and Bartolo came to see what condition it was in. He had been reared a Catholic and was probably still one in name, although it seems he was not very devout. On October 9th, a few days after his arrival, he was walking along a rather desolate road when suddenly a voice spoke to him. It told him that if he wished to be saved, he should spread devotion to the Rosary and that the Blessed Virgin had promised, that was the way to find salvation. 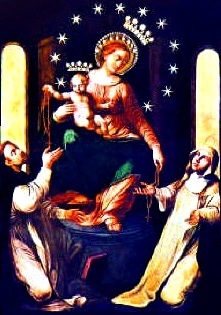 Bartolo fell on his knees and replied that if the Virgin had truly so promised then he would be saved; he would not leave the valley until he had popularized the Rosary. His early efforts to interest the people in the Rosary devotion do not seem to have been very successful, but he persisted, and in two or three years he had gathered quite a group around him for daily recitation of the prayers in the little chapel. The Bishop visited the valley in 1875, and complimented Bartolo on the good work he had done. He suggested that a church be built there in honor of Our Lady of Pompeii, and then, turning prophet, the Bishop pointed to a field near the chapel and declared that someday a basilica would stand on that spot. As the number of people taking part in the daily recitation of the Rosary grew, it was decided to obtain a picture of the Blessed Virgin, to help the faithful meditate as they prayed. On October 13, 1875, Bartolo went to Naples to see if he could find a suitable picture, but after searching for several days, to his great disappointment, he found that any really good picture would cost around four hundred francs, and he had nowhere near that amount to spend. He didn’t want to return empty handed, however, and disappoint the good people of Pompeii, so he somewhat reluctantly accepted a secondhand painting from a junk store for five lire. A trucker not knowing what the package contained pitched it on top of a load of garbage and so the picture arrived at the chapel. The people were pleased with the dilapidated picture and enshrined it. Almost immediately several miracles took place through Mary’s intercession as Our Lady of Pompeii. A church was built, 1876-1891 and a new basilica, 1934-1939, ordered by Pope Pius XI.